“The Catholic doctrine of transubstantiation is, without question, one of the most absurd doctrines ever imposed on a trusting public… Roman Catholic errors are inevitably human innovations that were inserted into the church during the early centuries. This teaching on the Eucharist follows this pattern. 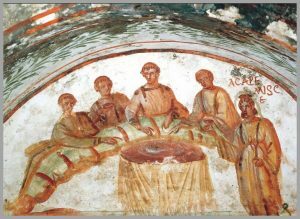 Early Christians celebrated the Eucharist as a sacrifice! “In the first century, as described in the New Testament, Holy Communion was a meal of fellowship eaten as a memorial to the death of Christ and a symbol of unity among Christians both with each other and with Christ. “In the second century it began to shift toward a ceremony, in which Christ was present in some undefined form. This was not yet the eventual Catholic doctrine of transubstantiation which was a development of the Middle Ages but it was a beginning in this unfortunate direction. For the whole article and chart, click here.